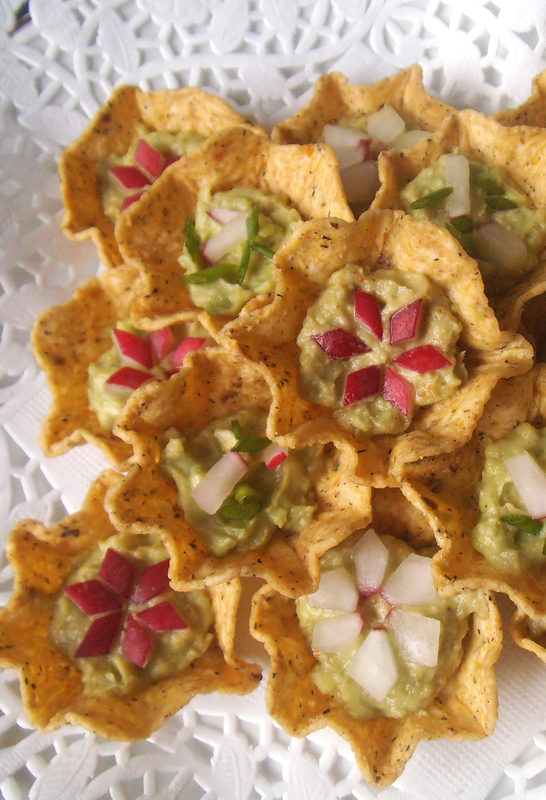 Pretty floral guacamole blossoms are great starters for gatherings during the holiday season. With only three ingredients, they are simple to make. And the poinsettia flowers can serve as more than a decoration–they can be a conversation starter as well. Why do we use poinsettias as Christmas decorations? Have you heard of the legend of the poinsettia? Did the legend precede the tradition, or vice versa? 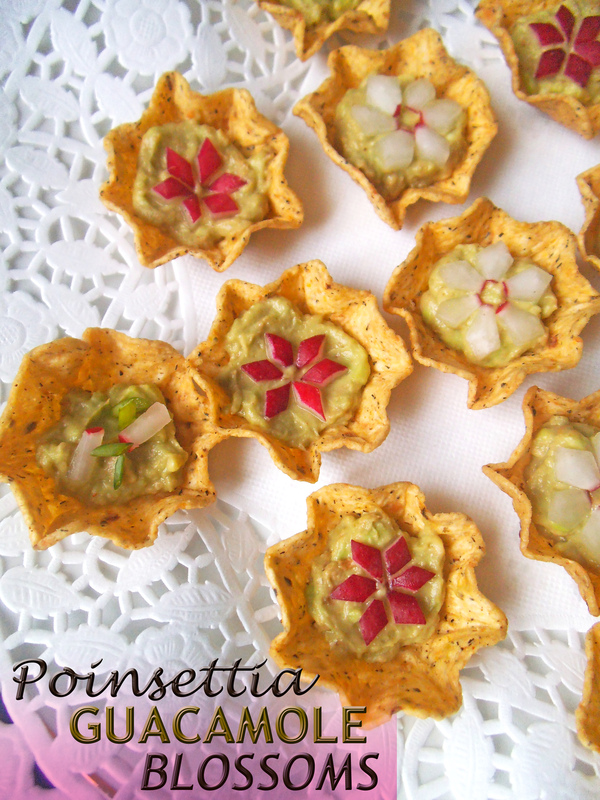 When making these guacamole blossoms, I recalled the Mexican legend of the poinsettia, and realized I should read it again to refresh our memories. In the story, leaves change from green to rich red in the presence of the Christ child. During this season of celebrating miracles, there can be so much bustling that we forget the significance of what we celebrate. Simplifying and connecting symbols to deeper meanings can be a step in the right direction. Good food is wonderful, but it is even better to enjoy it as a means to an end. When we share food and conversation, opportunities for connection are created. It is my hope that some of the recipes you use will be part of celebrating with others and taking the time to strengthen the bonds you share. May you have a blessed advent, a merry Christmas, and a happy holiday season. Place about 1-2 teaspoons of guacamole onto (or into) each tortilla chip. 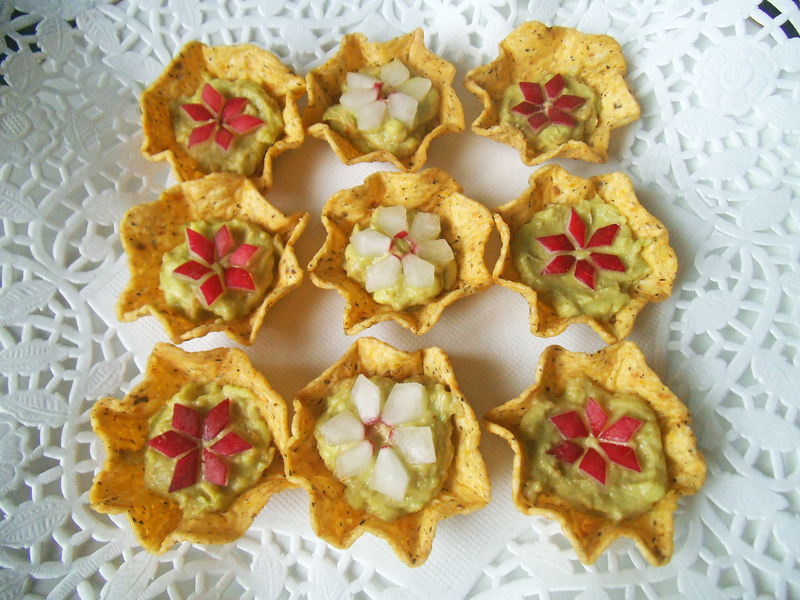 Carefully assemble petals cut from radishes to form red and/or white poinsettia flowers on top of the guacamole. Use additional radish bits and green onion to top more guacamole on other chips. Arrange guacamole blossoms on a platter and serve within one hour of assembling to ensure chips stay crisp. I like to share recipes here.